Premium Domains are names with short, common or desirable words. Usually providing a more memorable web address for a premium price. 5 Can I override the price? 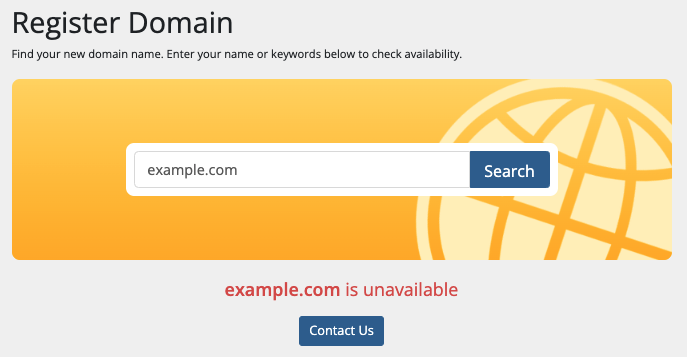 Premium Domains require that you have a Domain Lookup provider selected that supports them. To configure your Domain Lookup Provider, go to Setup > Products/Services > Domain Pricing and click the Change button below your currently configured provider. This will provide a list of registrars that support Domain Lookups and Suggestions. Click on a registrar, and if required, additional lookup configuration will be provided. Once configured, click on Save on the modal popup window to save the domain lookup configuration. 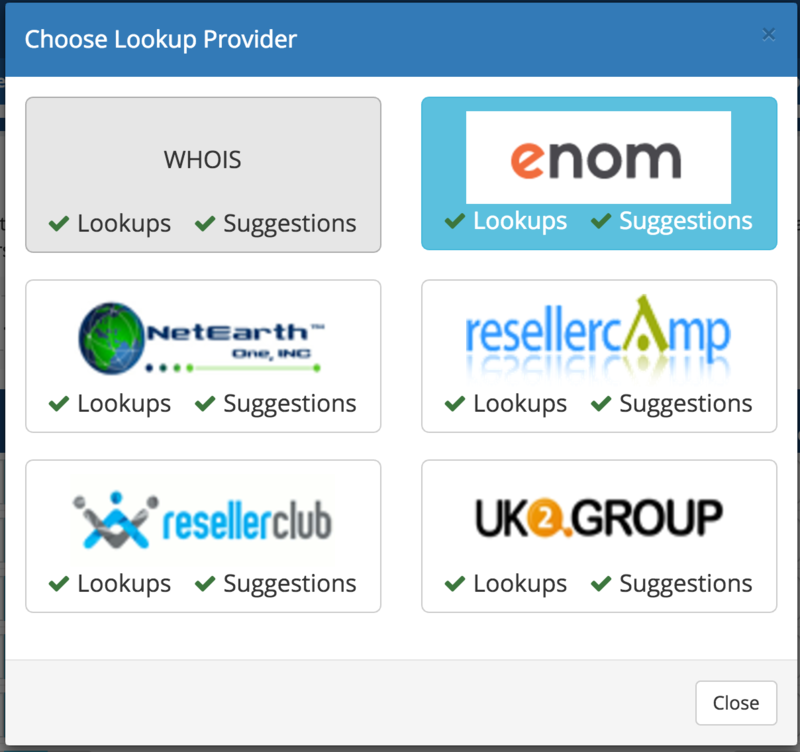 Once a Lookup Provider that supports Premium Domains is selected, Premium Domains can be enabled in WHMCS in Setup > Products/Services > Domain Pricing. Once enabled, the configuration of percentage markups will become possible. Returned Premium Prices will be in the currency configured for the registrar account. The currency of the registrar account must be available in Setup > Payments > Currencies. 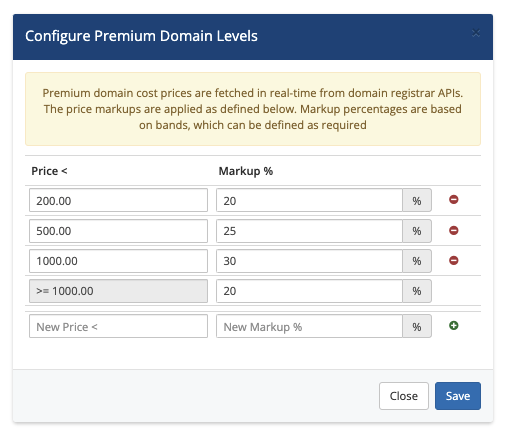 Premium domain cost prices are fetched in real-time from domain registrar APIs. The price markups are applied as defined in the configuration. Markup percentages are based on bands, which can be defined as required. Premium pricing levels are configured as up to, but not including, the price entered. Once enabled, ordering a domain, in the Client Area, that the registrar deems premium will have the markup applied. Registration for premium domains is only possible for 1 year. 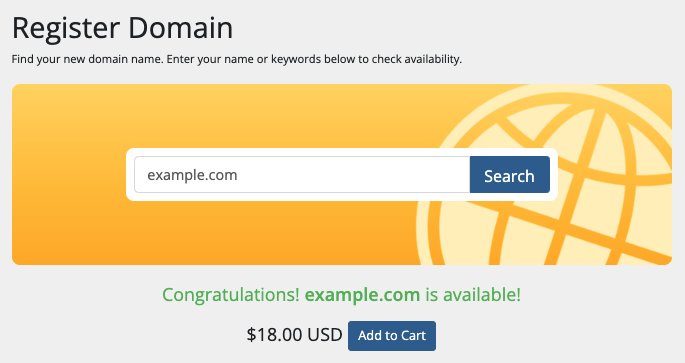 After buying, the domain is considered premium if a premium renewal price is available. The current raw renewal cost, in the Client currency, for a premium domain is under the Recurring Amount field. Consider the raw cost when making any manual changes to the recurring amount. Checking the automatic recalculation box will recalculate the recurring cost for the domain on save. The raw cost does not include any markup that will be applied. A premium domain is identified in the Admin Area by a badge next to the order type when viewing the domain. A premium domain cannot have the Registration Period changed from 1 year. A client ordering a domain renewal only be able to do so for the 1 year term and the price will be calculated based on the premium cost from the registrar. Can I override the price? A premium domain cost can range from tens of dollars, to thousands. There may be situations where the cost of the domain could exceed the balance of a registrar account, or require additional validation to confirm the customer is aware of the price they will be paying. WHMCS has a hook that allows the override of the registration or renewal price of the domain being ordered. Additionally, the same hook can instruct the customer to Contact Support, or show the domain as unavailable. A similar hook is available when recalculating the recurring renewal price for the domain using the Automatic Recalculation on Save in the Admin Area. PremiumPriceOverride Hook used when the domain is being ordered to override the prices for domain purchase. PremiumPriceRecalculationOverride Hook used to override the automatic recalculation on save pricing.